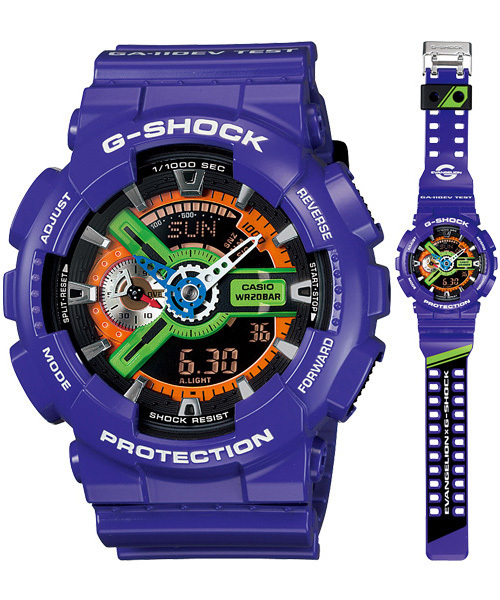 G-SHOCK and appeared to continue to originate from Japan to the world of street culture, a collaboration model with the *"Evangelion" animation theater was a big hit last year. Both originating the Japan Culture from Japan to the rest of the world for the fusion, this collaboration has been achieved. The base model, adopted the GA-110 case is the latest model of Big specification. The image of the aircraft of "Evangelion", and is the main color purple × green light. Coloring throughout many parts of the face design is combined, the orange has been used effectively as accent color for "Evangelion" also. 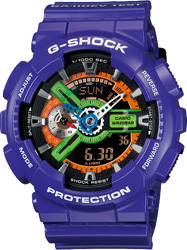 When the blue × white minute hand, the hero was according to the color of the "plug suit" to wear when flying in "Evangelion". Is with a special package that contains the logo only appeared in the movie of "NERV secret military agency." That expresses the culture of Japan is widespread among young people worldwide are referred to as "Cool Japan", is the emergence of special collaboration model. After the smash hit TV series was broadcast in 1995, revived as "Evangelion" to new in 2007. Work first published September 1, 2007 "Evangelion: Introduction" was greeted with enthusiasm also a new young fan base. The second film series "Rebuild of Evangelion: fracture" will be published on June 27, 2009, 4.0 billion yen box office revenue, animation Chodokyu marked mobilization of over 2.9 million number. Not only anime, fashion apparel-related products, including taking advantage of its innovative design, expand to all genres, that evokes a new movement.